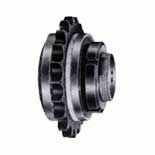 We are a famous torque coupling manufacturer and supplier from India. We also bring Torque Limiter Coupling, torque limiter etc., which are widely used in various industrial applications. Torque limiter is a protective device that limits torque transmitted in a drive system by slipping when torque demand exceeds a preset value as a result of shock loads, over loads or machine jams. It automatically re-engages when the overload torque has passed, no resetting is required. The torque limiter prevents machine damage and eliminates costly down time. It utilizes spring friction surfaces for its operation; slip torque is preset by adjustment of the spring force. Torque limiter can be used with a sprocket, gear, sheave or flange plate as a centre member that is clamped between two friction facings.